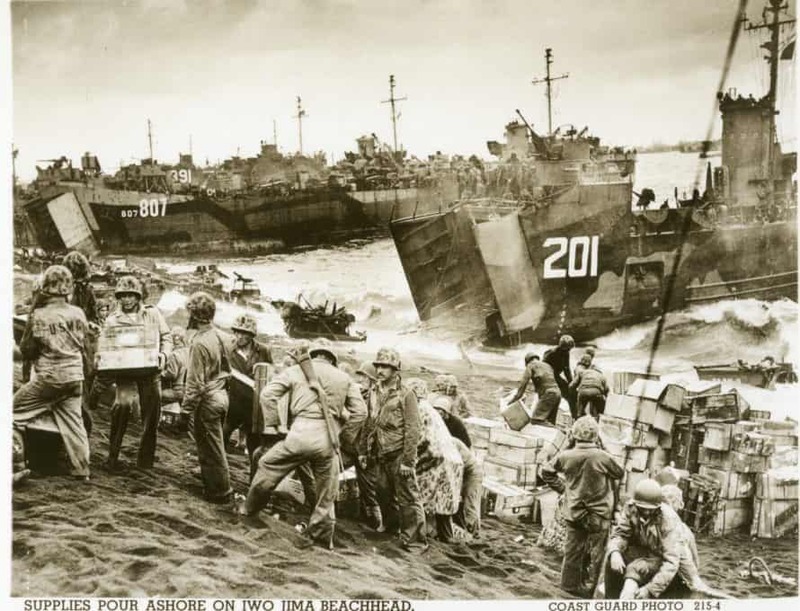 IWO JIMA – Missourian John Wheeler sailed on LST 807, seen on the left in this photo, as it landed on the sands of Iwo Jima during World War II. Coast Guard photo. EOLIA – War is full of extraordinary men and women doing extraordinary feats under extraordinary circumstances. But just because a soldier or sailor doesn’t have a story worthy of the silver screen doesn’t mean they – and their families – didn’t make enormous sacrifices for God and country. Such is the case with just two of countless Missouri Baptists who served in harms way during World War II: William Friese, Sr., who fought in the Battle of the Bulge and James Wheeler, Sr., who landed tanks on the beaches of Iwo Jima. Wheeler was drafted in 1943. He was a senior citizen by military standards – 36 years old. John’s grandmother moved in with him, his mother, and his brother at their home near Eolia, near Bowling Green. At 8 years old, he was the man of the house while his father was sent to Idaho for naval basic training. After basic training and diesel school, James was assigned to a “Landing Ship – Tank,” or LST for short. The 328-foot-long special transport ships had a flat keel that allowed them to slip right up to the beach, where two enormous doors on the bow would swing open, allowing Sherman tanks to begin fighting as soon as possible. As fate would have it, his LST – LST 807 – made landfall and released her tanks on the sands of Iwo Jima, one of the most infamous battles of the war in the Pacific. James was relatively fortunate – he wasn’t on the bloody front lines like the marines that raised the flag in the iconic photo. However, he and a small fleet of LSTs were also a tempting stationary target for any artillery that happened to take aim. James was released in 1946. He made it home to his family without a scratch. He rarely talked about any of his experiences, though his son has his discharge papers, training records and the like. His three sons all enlisted in the Navy when they were old enough, following in his footsteps. John became a machinist’s mate just like his father, and served in the engine room on a tanker during the Korean conflict. He now lives in St. Paul and attends First Baptist Church in O’Fallon. He also serves as a trustee of the Missouri Baptist Foundation. James Wheeler, Sr., passed away in 1987. William Friese, Sr., didn’t escape his time in Europe without a scratch, but he would be the first to call himself fortunate. William ran away from home at 14, and lied about his age to join the Army at 16. He was sent to Europe, and fought in three battles, including the Battle of the Bulge, where he was “blown out of a fox hole” and nearly killed, his son, Bill Friese, Jr., a member of Hazelwood Baptist Church and also a Missouri Baptist Foundation trustee, said. When he arrived in Bastogne at 18 years old, the artillery he’d been trained on weren’t there and would never arrive. He was reassigned to the infantry, where he was promptly hit by an artillery round that demanded his hips be rebuilt. He was moved behind the lines and sent to a hospital ship. Eventually, he made his way back to an Army hospital in San Diego where he recovered, but still with what his son called a 50 percent disability. Still, he learned how to walk again while he was staying with his brother in Birmingham, Ala. It was there he accepted Christ. Neither his lingering wounds nor his lack of formal education held him back. He later owned his own furniture store, and from 1968 to 1970 several as a Missouri State representative from St. Louis. 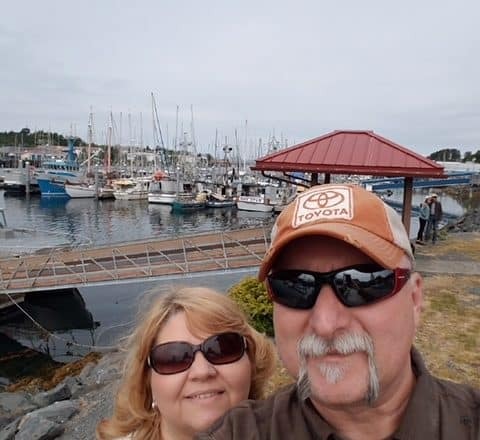 Geraldine, a member of Owensville Baptist Church, said that her late husband rarely talked about his traumatic experience, but the shrapnel that occasionally worked its way to the surface of his skin told the story well enough. William Friese, Sr. passed away in 2013.